If you’ve been paying any attention to NF research in the last several years you’ll have noticed that in clinical trials some drugs are showing a lot of promise in the treatment of NF1 plexiform tumors and NF2 tumors. 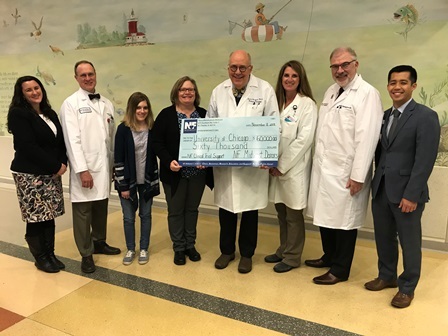 For over 36 years NF Midwest has been funding research for the many complications of neurofibromatosis type 1, type 2, and schwannomatosis and now clinical trials are being done in the Midwest region and patients are benefitting! This is very exciting, BUT we’ve discovered that the clinical trial research teams in our area need extra funding to support these trials. There are 22 NF clinics that work together on clinical trials in what is called the NF Consortium. We’re very fortunate to have FOUR clinics that are part of the NF Consortium and offering great NF clinical research right here in our region. Because clinical trials often require extra research and clinical staff to work with the patients and to handle the bureaucratic overload, they need funding to support their efforts. 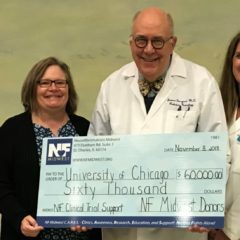 This is why NF Midwest recently gave the University of Chicago $60,000. The University of Chicago has proven to be one of the premier sites for NF clinical trials. When all 22 of the NF consortium sites were evaluated last year, the University of Chicago was ranked #2 for enrollment, compliance, and scientific contribution. They also enrolled more patients than any other US center on two recent clinical trials. Yet, earlier this year they informed us that they were underfunded. So NF Midwest stepped up and filled that gap. We couldn’t have done it without our donors! The funding won’t last though, and we desperately need to be prepared to provide funding to all the clinical trial sites in the Midwest when needed. If you’d like to support clinical trials in the Midwest region, please make a donation at 7 AM (CST) on our Facebook page. If your timing is good, your donation may be doubled through a $7 million dollar match program funded by Facebook and PayPal. Last year the matching funds were gone in 7 minutes! We need you to help NF receive a piece of that! Wonderful news! We’re making so much progress with NF! and let us know where you live.